This 3D printed part allows you to join two 10 round CZ / Lithgow poly mags together in a V-Shape.&n.. The MagnetoSpeed T1000 Target Hit Indicator takes the second guessing away from seeing imp..
NEW AND IMPROVED!!! 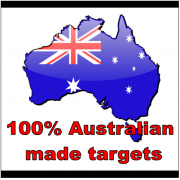 AN AUSTRALIAN PATENTED INVENTION BY STS The Shooters' Rule&nb.. This 3D Printed part replaces the annoying primer catcher tray on the RCBS Rock Chucker Supreme IV r.. The STS Fox Whistle is made from polished 316 grade stainless steel. Once mastered the loud raspy so..